Credit card debt can be crippling seeing as how 38% of U.S. households admit to having it in one form or another. Trying to get rid of your credit card debt can be a long-term process since interest rates are often high. This can cause you to spend several months, or even years, paying off your debt if you only stick to making minimum payments. If you want to pay off your credit cards or any quick loans faster, the first step is to stop using them. Then, start paying them down one-by-one. One of the best strategies to use involves getting a balance transfer. A balance transfer can be an ideal way to consolidate your credit card debt. It can also lower the interest rate. This way you can put more money toward the principle. Understanding how it works is simple. Generally, a credit card company will offer you a 0% APR for a limited time when you transfer your credit card balance from your current card to their card. Once you transfer your balance to the new credit card, you can take advantage of a 0% interest rate for anywhere from 6 months to 24 months. With no interest to worry about, you can focus on paying off your credit card debt faster since every dollar will go toward the principle. Think of how much you could save if you have been dealing with an 18% interest rate on your credit cards and throwing away extra money each time you make a payment. While it sounds like a balance transfer could be the answer to eliminating interest payments and speeding up your debt repayment progress, there are a few factors you need to consider first. Setting up a balance transfer is pretty simple. Plus, it can be a great way to get rid of the high-interest rate on your credit card debt. At the very least, a balance transfer can buy you time to catch up on old debts. You can set up a balance transfer online or even by phone. When you apply for a balance transfer, you need to continue paying on your debt until you get approved and actually transfer your balance. Processing your request could take a few days. So, if your credit card bill is due during that time, you’ll need to pay it like normal to avoid a late fee. You want the process to move quickly because balance transfer offers won’t be permanent. Usually, you’ll need to transfer your balance within 60 days of being approved for the balance transfer offer. Also, be sure to read the fine print and terms for your balance transfer. Most times, the 0% APR offer is only an introductory offer and will expire in a few months. The 0% introductory APR may only apply to transfer balances and not new purchases. So, it’s best to avoid using your new card to buy things, especially if you’re focused on eliminating credit card debt. Before you apply for a balance transfer credit card, make sure your credit score is in good shape. If you don’t know your credit score, you get an estimated credit score for free from Credit Sesame. When it comes to choosing the best credit card to transfer your balance to, you want to consider a few key things. This is one of the most important factors to consider. 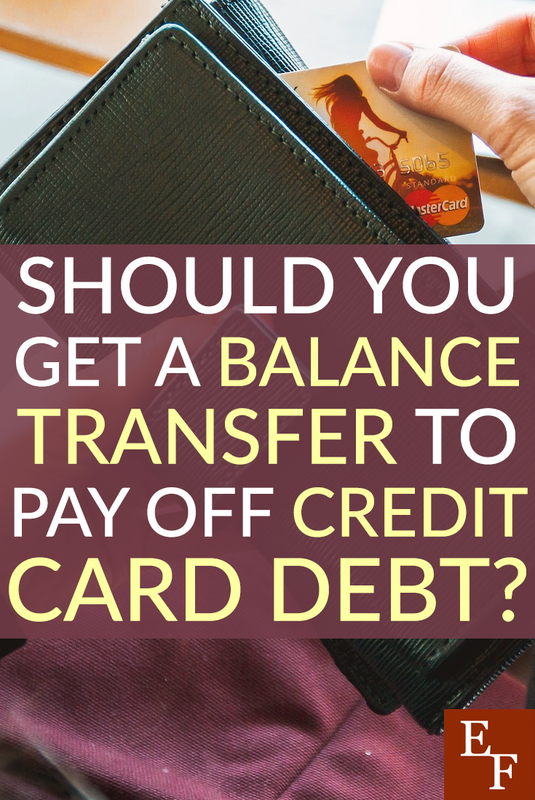 If you have a lot of credit card debt and want to transfer the balance to another card, you’ll want to be approved for a card with a high limit that will allow this. Being approved for a card with a $2,000 credit limit may or may not help if you have a lot of debt. Don’t forget to consider how this will affect your overall credit utilization ratio. Keeping your utilization at or below 30% will be good for your credit, whereas maxing out your credit limit can deplete your score. This is also important to keep in mind when searching for the best option for you. First, you want to calculate how long it would take to pay back your credit card debt. Then, find a balance transfer card with a promotional interest rate period that is long enough. Citi credit cards tend to offer some of the best 0% APR offers, sometimes up to 22 months. The longer the offer period, the more time you’ll have to pay down your debt and avoid paying a higher interest rate after the promotional rate expires. Most times, you’ll be charged a fee when you initiate a balance transfer. That fee is usually $5.00 or 3% – 5% of the amount you’re transferring, whichever is higher. This means that if you’re transferring a $5,000 balance, you’ll pay $150 if the fee is 3%. Don’t forget that this will eat into your savings. Before you transfer your debt, calculate how much you’ll save in interested by doing the transfer. Take off the fee and see if it’s still worth it. Finally, many credit cards have annual fees too. The annual fee may be waived the first year, but it could surprise you if you decide to keep the card for the following year. It’s best to choose a balance transfer card without an annual fee to save you some money. So, Should You Get a Balance Transfer? Getting a balance transfer has many benefits, but there are a few drawbacks. If you’re on the fence, really weigh your needs and goals, and calculate the potential savings. If you’re currently paying on a $5,000 credit card balance with an 18% interest rate, transferring it to a 0% interest rate card for 18 months would cost you a $150 fee upfront. But, you’d save $743 in interest over the next year and a half for a net savings of $593. As long as you use a balance transfer solely for the purpose of paying off your debt, you could clearly save money in this scenario and speed up the process. You probably shouldn’t get a balance transfer if you will feel too tempted to spend money with your new credit card. You also shouldn’t get one if you don’t think you’ll be able to pay off your debt before the promotional APR expires. Don’t forget to plan for the unexpected, too. With an aggressive payment schedule, you may be able to pay off your debt before the APR expires. But, what happens if you lose your job or have to pay for an expensive unexpected expense? Will you still be able to pay it off before the APR expires? Do your best to find a card that gives you some wiggle room if possible. Have you ever used a balance transfer or considered getting one?